Two Speed Buffer: Baldor buffers are engineered for maximum reliability under the most demanding conditions. All buffers listed are 1 phase, 115 volt. 2 speeds are excellent for buffing both soft metals and hard metals. 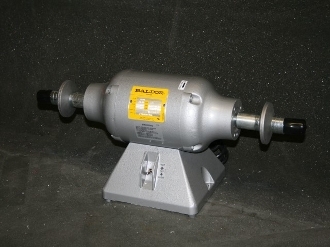 Low speed 1800 rpm for soft metals such as Aluminum, Copper, and Brass. High speed 3600 rpm for hard metals such as Stainless Steel. 1/2hp buffer uses 8" pads with 5/8" center.